This week the Association of American Publishers (AAP) released Q3 revenue numbers from more than 1,200 trade, K-12, higher education, university press, and professional publishers. The data spans January to September of 2015, and compared to the same period in 2014, publishers’ net revenue declined 2% from $12.1 billion to $11.9 billion. Driving much of the decline, as Book Business blogger Caleb Mason predicted last week, was a significant drop in ebook revenue. Net revenue for ebooks declined 11.1%, the majority of which came from a significant 44.8% drop in the children and YA category. 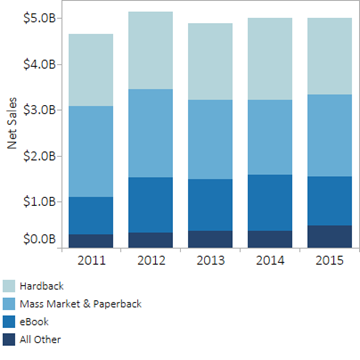 As the AAP’s chart below demonstrates, ebooks’ share of overall book revenue dropped somewhat from 2014 to 2015. In his post, Mason attributed this decline to an increase in ebook prices which occurred after several large trade publishers renegotiated their contracts with Amazon in 2015. Audiobooks continued their reign as the fastest-growing book format, with 37.7% growth compared to the first three quarters of 2014. PreK-12 and higher education course material revenues declined by 5% and 4.4%, respectively, from January to September of 2015. Adult trade books, including fiction and non-fiction, grew by 2.9% reaching $3.5 billion in net revenue. It is important to note that the AAP sales figures represent publishers’ net revenue for the U.S., meaning revenue generated from books sold to retailers, directly to consumers, and online. These numbers are not representative of what retailers sold to consumers. See the full press release from the AAP below. Washington, DC; Jan. 27, 2016 – Publishers’ book sales for the first three quarters of the year (Jan. – Sept. 2015) were down 2.0% at $11.9 billion compared to $12.1 billion for the first nine months in 2014. These numbers include sales for all tracked categories (Trade - fiction/non-fiction/religious, K-12 Instructional Materials, Higher Education Course Materials, Professional Publishing, and University Presses). Revenue for trade books was flat. Publishers net revenue is tracked monthly by the Association of American Publishers (AAP) and includes sales data from more than 1,200 publishers (#AAPStats). While sales for trade books overall were flat, the categories within had different growth trajectories from Jan. – Sept.: Adult Books were up 2.9%, Children/YA were down 7.4%, and Religious Presses were down 1.5%. Paperbacks and downloaded audiobooks within the trade category grew in double digits. Sales declined for Higher Educational Course Materials and PreK-12 Instructional Materials. Year-to-date, Trade Book revenues were flat at $5.0 billion. Adult Books: The largest of the categories grew to $3.5 billion through Sept. 2015 compared to 3.4 billion in the same timeframe in 2014. Within that, paperback books (16.0%) and downloaded audio (41.5%) were the formats with the greatest growth. This category has shown growth every month in 2015, with the exception of Feb.
Children/YA: Revenue within the category declined to $1.1 billion through Sept. 2015 from $1.2 billion for the same timeframe in 2014. eBooks (44.8%) and hardback books (14.5%) led the overall 7.4% decline in the category. We’re still seeing the impact of tough competition against 2014 blockbuster titles, including the Divergent series. Religious Presses were down 1.5%, with $390.1 million in revenue to date in 2015 compared to $395.9 million in 2014. “Adult books are leading the way so far this year for growth in the trade category. This is a stark contrast to the tremendous growth last year in Children and Young Adult books,” said Tina Jordan, Vice President at the Association of American Publishers. Downloaded audio remained the fastest-growing format, with 37.7% growth compared to the same period in 2014.
eBooks were down 11.1%, with most of the decline coming from Children/YA books (44.8%). Paperbacks continued their good performance this year with 13.3% growth. Hardback books were down 6.4%. Revenues for PreK-12 instructional materials were down by 5.0% in the first three quarters of the year. Higher Education course materials were down 4.4%. Sales for Professional Publishing, which includes business, medical, law, scientific and technical books and journals, are up 13.0% through Sept. 2015 compared to the same timeframe in 2014. University Presses declined slightly at 1.8%. The Association of American Publishers (AAP) represents about four hundred member organizations including major commercial, digital learning and education and professional publishers alongside independents, non-profits, university presses and scholarly societies. We represent the industry’s priorities on policy, legislative and regulatory issues regionally, nationally and worldwide. These include the protection of intellectual property rights and worldwide copyright enforcement, digital and new technology issues, funding for education and libraries, tax and trade, censorship and literacy. Find us online at www.publishers.org or on twitter at @AmericanPublish.